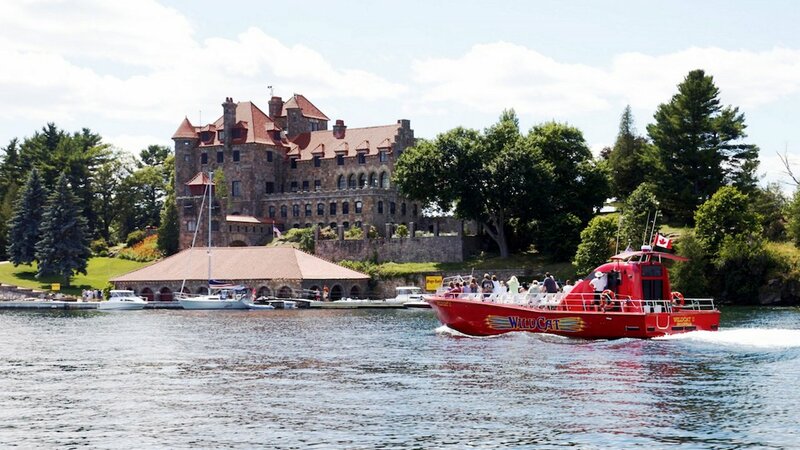 Experience the ‘WildCat’ for less on our one-hour, 24 mile (38 km) high-speed adventure featuring the two eastern groups of the 1000 Islands, the St. Lawrence Seaway, Crossover Island Lighthouse and a view of famous Singer Castle, built on the fortunes of the Singer Sewing Machine Company. Faites une croisière de 1 heure en confort et sécurité dans une aventure vivifiante à haute vitesse qui comprend une vue des châteaux Singer. Une expérience d'aventure douce qui est amusante pour tous les âges. Soak up some sun and experience the fun as you bask in the fresh, clean breezes of the mighty St. Lawrence and enjoy our licensed beverage and snack bar service. At speed, enjoy our toe-tapping classic rock soundtrack while during slower portions of the tour, our Captain’s commentary provides an accurate account of the regions’ history, its legends and its people. May 18 - June 28: Weekends & Holidays at 1:00 p.m.
September 3 – October 14: - Weekends & Holidays at 1:00 p.m.
Rates & Schedules subject to change. 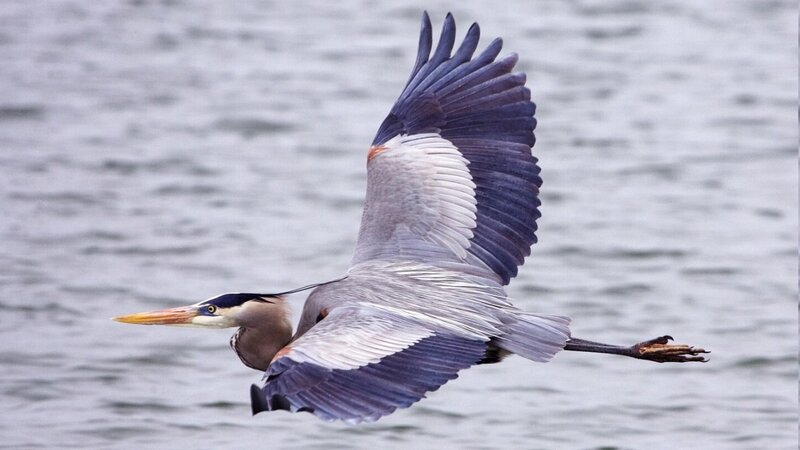 All departures subject to minimum passenger requirements. Reservations strongly recommended. Additional departures and Private Charters available for Groups. Group Discounts are not applicable to Family Rates. All cruise durations are +/- 10 minutes. 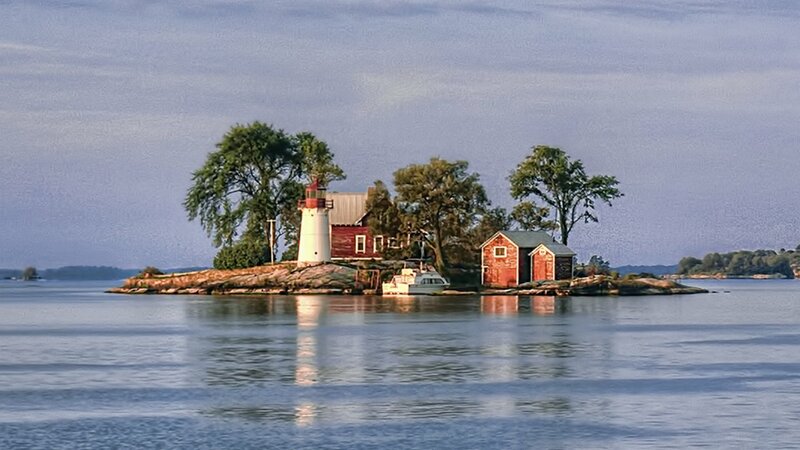 1000 Islands & Seaway Cruises Brockville operations are located on Block House Island in the historic downtown commercial/tourism district. As Brockville's premier waterfront Park, Blockhouse Island is the hub of the City's tourism activity including the Cruise Line, the Crow's Nest Bistro (120 seat outdoor patio), Souvenir Shops, Tourism Info Centre, Marina, Seaway Ship Viewing, Childrens Playground, Picnic Area and Public Restrooms. Limited free parking available on site but, plenty of parking nearby at a nominal fee but all Municipal parking is free on weekends and holidays. 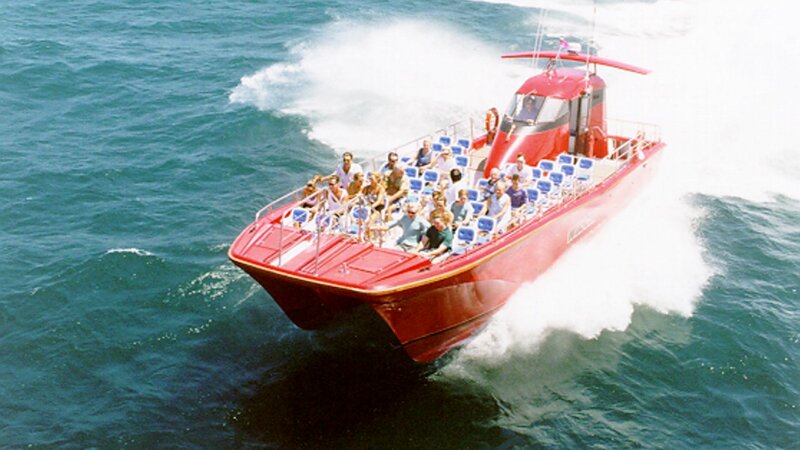 Why take the WildCat over the traditional cruises? 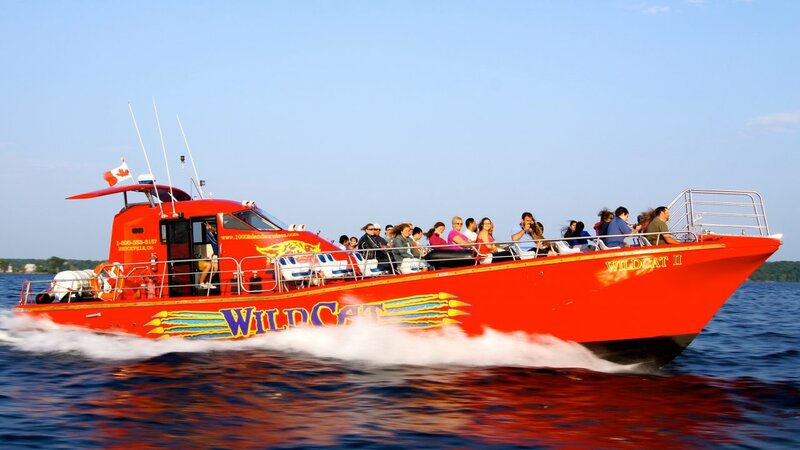 The WildCat travels at an average speed of 36 to 38 mph so it is able to cover much more distance than the traditional cruises which travel at an average of 10 mph. Simply put, that makes for a more complete Island experience as you see much more of the Islands. The 1 hour "Singer Castle Express" Cruise makes for a convenient short-term cruise and covers over 20 miles of the Islands, including a view of famous Singer Castle and historic Crossover Island Lighthouse, all the while travelling in the shadows of ships plying the main Seaway Channel! 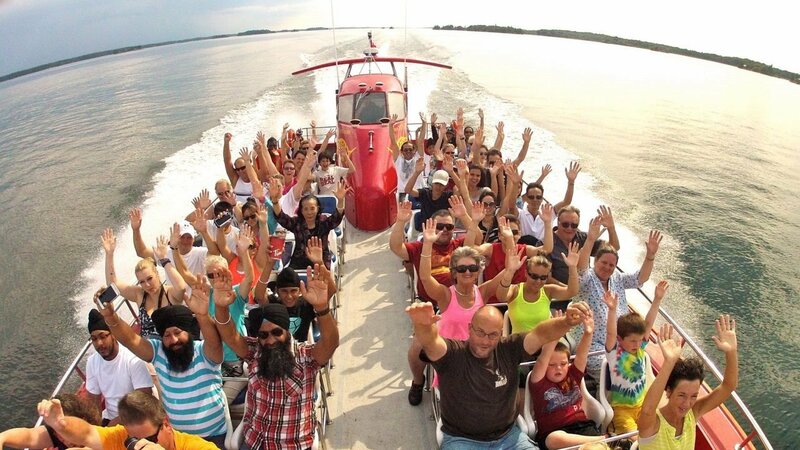 The speed of the boat and its open-air cockpit create a fun experience for passengers of ALL ages! 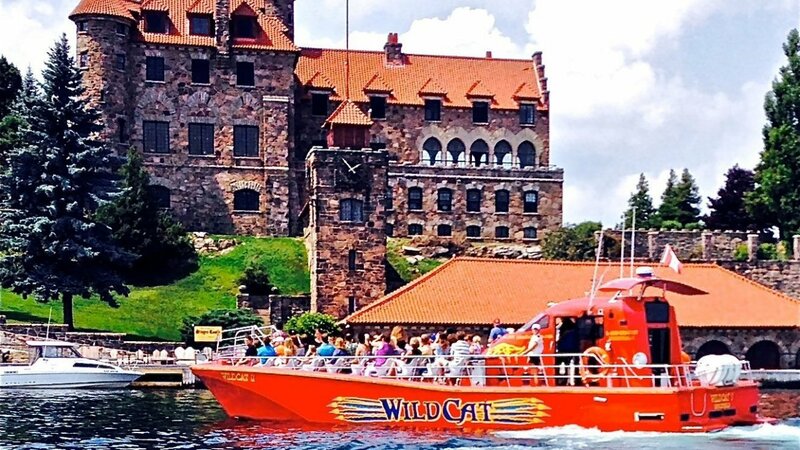 So, choose the WildCat for your 1000 Islands experience! No, imagine doing 45 mph in your car? It's just a little more exhilarating over the water and very refreshing on a hot summer's day. 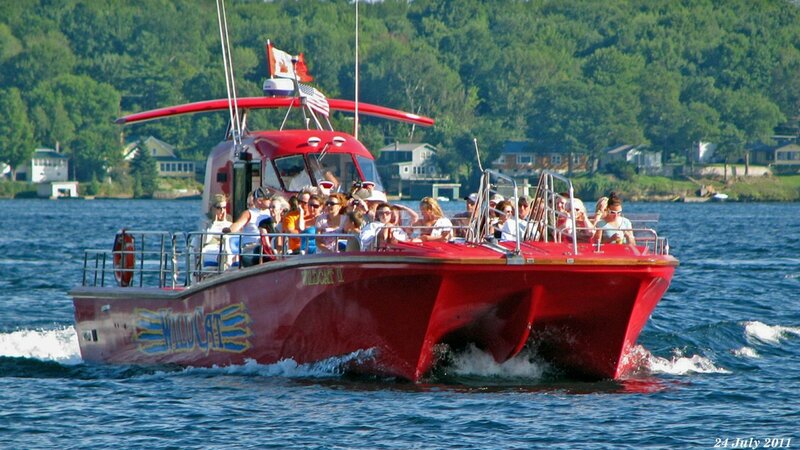 By no means are we the fastest boat on the River, the WildCat is just the fastest tour boat in the 1000 Islands. Why does the WildCat cost more than the traditional cruises? 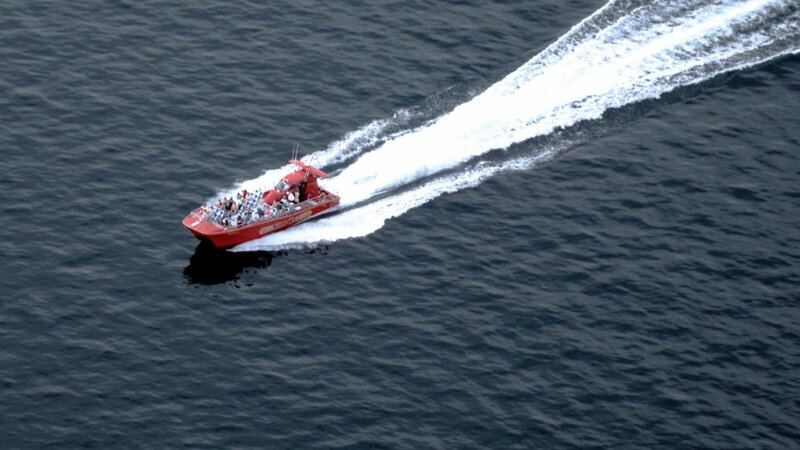 Well, to be perfectly honest, speed costs money but we assure you that our WildCat Cruises are worth every penny! If this is your first visit to the Islands, why not see them in style? If you've been to the Islands before, you've probably never seen the Islands like this! Does the boat stop to visit the Castles? No, the Castles are in the U.S.A. and Brockville has no Customs facilities to clear returning passengers. A good attitude, sunscreen and hat, a light rain jacket. Don't forget your camera! It's always cooler over the water, especially with speed so, please dress according to the weather. Bring cash for beverages and snacks; no credit or debit cards accepted on board. Unlike other adventure experiences, including Whitewater Rafting and Jet Boating, our WildCat Cruises are not designed as a "get-wet" experience although we do get some spray depending on the sea state and prevailing winds. Rain is always a possibility too. Is there food and beverages available on board? Yes, the WildCat offers a licensed beverage (alcoholic and non-alcoholic) and snack service at your seats during low-speed segments of the voyage. Cash only as there is no credit/debit processing available on board. Will I see anything at that speed? The high speed segments are across open stretches of water. The vessel slows at the main attractions for commentary and photography. No, due to the vessel's design limitations.